In an exclusive, The Wrap reports Animal Plant has ordered the Texas Vets TV series. 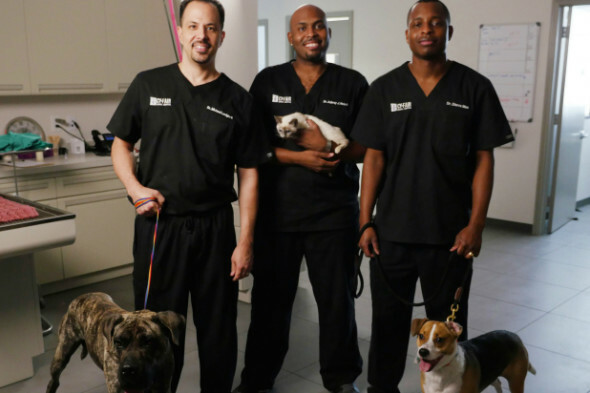 According to the report, this eight-episode reality series features three Houston, Texas veterinarians. The trio runs a veterinary clinic and animal shelter. The series is slated to premiere Saturday, June 4, 2016, at 10:00pm ET/PT. UPDATE 5/20/2016: The series has been renamed The Vet Life, and will now premiere June 4th at 9:00pm. Per The Wrap, on Texas Vets, “Dr. Diarra Blue, Dr. Aubrey Ross and Dr. Michael Lavigne navigate the balancing act of running their animal hospital and rescue while balancing family.” The Texas Vets TV show is produced by Nancy Glass Productions with Argle Bargle Films. Executive producers are Nancy Glass, Argle Bargle Films, Jairus Cobb, Shannon Biggs, and Keith Hoffman. Sarah Russell is associate producing. The three doctors developed a strong friendship while attending Tuskegee University’s College of Veterinary Medicine and reconvened in Las Vegas where they began their careers and honed their surgery skills. After years of paying their dues, they decided to fulfill their dreams of owning their own practice and set their sights on Dr. Ross’ hometown of Houston. In 2015, Cy-Fair Animal Hospital opened its doors to service the community and their pets. The veterinarians are dedicated to providing the best care for their patients — both human and animal, the cable channel promised. Dr. Blue’s personality keeps customers smiling and in good spirits while Dr. Ross keeps the clinic running during an often hectic work day. Dr. Lavigne is a skilled surgeon who provides balance. With a combined experience of over 22 years and a shared love of animals, the three vets thrive to educate the public about the importance of preventative medicine in order to extend the longevity of the human animal bond. What do you think? How do you like the sound of Texas Vets. Do you plan to watch the first season and series premiere, on Animal Planet? Tell us. More about: Animal Planet TV shows: canceled or renewed?, Texas Vets, Texas Vets: canceled or renewed?, The Vet Life, The Vet Life: canceled or renewed? This was a great show. Please bring back The Vet Life. This was a great show….please bring The Vet Life back. I like the Vet Life. Viewers will be following it, why change the name? Are you going to change Dr Pol? Of course not. If it’s not broken, don’t fix it. Looking forward to watch these 3 docs again! Hi, have not seen the show in a while. I see now that the show will be back on in June. Ok, have a bless day. I thought the show was awesome. I was frustrated that I had to start from the beginning and binge watch what was left of the show. Not knowing the total number of seasons and episodes. I love they’re show no matter what name is used. I see and feel that they love all animals, please continue the show. Love you guys. I really enjoy the Vet Life. It shows us the real day to day lives of the vets, their expertise and a variety of animals. They are also a shining example for their ethnic followers.